Back in 1977 in the UK I was pregnant, and this series was running on BBC. I – like most female viewers – fell in love with the character of Ross Poldark, and for a while really wanted to call our baby Ross. Fortunately Him Indoors persuaded me that Ross Zelos wasn’t a good match….then going for hospital check-ups we used to pass the St Raphael club and I flirted with the idea of Raphael. Dangerous letting a pregnant lady name a child!! Anyway, hooked on the series I then bought all the books as they were released, some new and many from second-hand shops…lots of my books are preloved! Originally there were four, but after the success of the TV series the author continued with the books. These early ones are still my favourite though. After discovering eBooks I’ve wanted to collect this series on kindle – sadly eyesight issues mean I can no longer read traditional print books, so the chance to review these first two was really welcome. They’re difficult to categorise in many ways, being part romance, part history and part just a snippet of life and characters pulled out of time. That’s the way I love history – hated it at school, all dates and dull facts, but wrap it round characters that feel real and undergo genuine experiences and the Poor Laws, the Corn Riots ect all become so much more interesting and memorable. If my history lessons were formatted this way I’d have done so much better ( well, couldn’t have done worse!) History when it comes alive is fabulous, and I really love the subject now, and look up things just for the pleasure of reading about people and their lives back in time. This book takes Ross Poldark, returned home to his small farm from the war in America. His father is dead, his mum died many years before, and he has no other close family except his cousins Francis and Verity and his Uncle Charles. They live in the Elizabethan manor Trenwith, and the story really revolves around the two families and the lifestyle of the times. Ross has kept his vision of Elizabeth, the girl he was to marry before he left for war and is looking forward to reuniting with her, but comes home to find everyone thought him dead, Elizabeth is to marry Francis, his home and farm is in a complete shambles and he has no real money….a hard start to his new life. Unlike the Trenwith Poldarks Ross has always been close to many of the local miners, played with them as a child and worked alongside them in the mines and they respect him for that. He’s now in a hard place, as an adult of the Gentry he shouldn’t be so close to them, but take his place in Society, but he feels closer to the miners and their families. For a while his time is taken with rebuilding the farm and house, working hard to get over – or at least past – the tumult Elizabeth marrying Francis has caused. We see their everyday life, the difference between the two factions, the poverty and struggle to survive for the villagers, where work depends on a whim, where without money they are evicted, starve and there’s no security net – it really is work or die, and then there’s the contrast of the Upper Classes, who feel their place is life is ordained by God, that they have a right to their lifestyles even though it comes at the price of starvation for the workers….When he brings home a child being beaten at a local fair, he unwittingly brings into his life the catalyst for huge change. The boy turns out to be a girl, Demelza and in time his wife and mother of his children. That’s a long way off though. 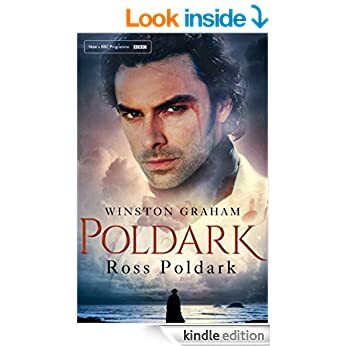 We get as far as the beginning of their life together but most of this book is naturally Ross, and his return to Cornwall, rebuilding his life and trying to find his place in it. Demelza is the subject of the next book. Its a realistic look at how life was then but personalised and not just dull facts, and if like me that’s how you love your history then this series is for you. I get really engaged with the characters, feel for them, worry about them and it all feels very very real. Families worked or ended up in the Poorhouse, and once there that was it – few came out. Families were separated, boys and men one way, girls and women the other. No wonder they’d do almost anything to avoid it, parents worked even when seriously ill, and kids went to work soon as they could, with 6 years olds doing 10-12 hour days in mines or on farms for just pennies a week. Ross feels for them, does what he can to provide work, but hasn’t much himself and needs to keep his own farm and mines afloat. The times too prevent him from interfering too much, with their draconian laws and expectations that people in his social class will adhere to societal norms. He struggles with the dilemma of his inclinations v the accepted way of life for people in his position. Stars: Five, fabulous read, brilliant series, and I’m so pleased to be back in that world once more..